"Dame Sally Davies [Chief Medical Officer for England] said there were signs funding was being cut at a time when the cost to the economy was rising. Her annual report said mental illness led to the loss of 70 million working days last year - up 24% since 2009." "Around 70 million working days were lost to mental illness last year at an "astounding" cost of up to £100 billion to the economy, her report says." There are two issues with the coverage of the Chief Medical Officer's report on mental health today. The report said that 70 million sick days were caused by mental health problems in 2013. That was an error - one of the report's authors has told us the online version will be updated to make clear that the 70 million figure actually refers to 2007. There's no more recent estimate using the same methodology. Separate figures from the ONS showed the number of days lost to 'stress, depression, anxiety' has risen to 15.2 million in 2013 from 12.3 million in 2009, a rise of 23%. But these figures aren't directly comparable to the 70 million estimate so we don't know if the same upward trend would apply to it. And some papers, including the Telegraph and Daily Mail, took the report's estimate of the total economic cost of mental illness and reported it as the costs of sickness absence due to mental illness. The estimate - that mental illness costs the UK economy between £70 billion and £100 billion every year - includes costs like the money spent on health care and the reduced productivity of those who are in work. We've covered some of the difficulties in estimating who is and isn't suffering from mental illness in the past. Asking people whether or not they've been mentally ill can be problematic because they might have differing views on what "counts" as mental illness, or might not want to talk about it openly. In 2007 the Centre for Mental Health (CMH) looked at a number of estimates of the proportion of sick days which were attributable to mental ill health. One survey conducted by the ONS in 2000 'screened' participants for a number of mental health disorders by assessing their symptoms against a set list. The CMH say the survey indicates 44.6% of days lost to sickness absence were accounted for by people who screened positive, although this "includes all time off work taken by people with mental health conditions, including absence because of co-existing physical health conditions". We haven't yet been able to find that figure in the report. Another survey by the Confederation of British Industry found the proportion of illnesses that can be attributed directly to mental illnesses was 36%. The CMH took the middle point of the two figures and estimated about 40% of sickness leave was down to mental illness, something that it calculated as coming to 70 million sick days in total. 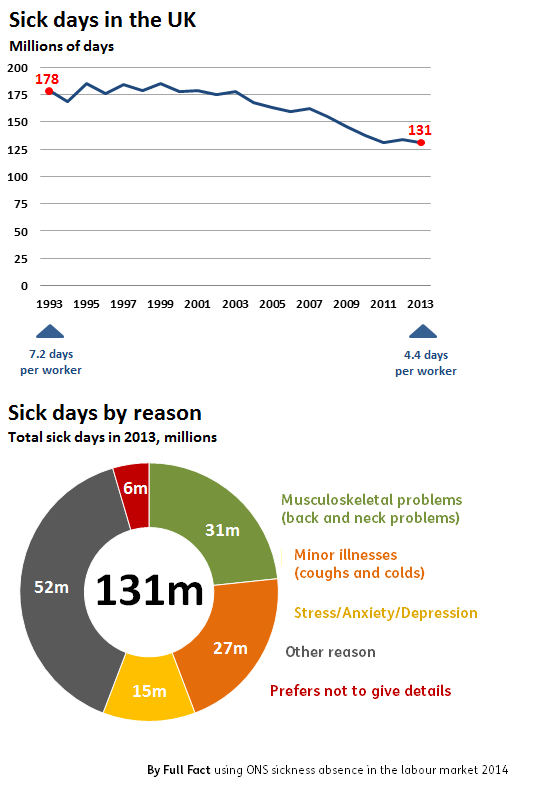 The ONS also publishes estimates of sick days based on its Labour Force Survey. An estimated 15.2 million would give stress, anxiety, and/or depression as one of the top reasons for sickness absence in 2013, compared to 31 million who said they were off due to back and/or neck problems, and 27 million who were off due to minor illnesses such as coughs and colds. This year the OECD estimated that mental ill-health costs the UK £70 billion every year "through lost productivity, social benefits and health care", which it said represented 4.5% of UK GDP. An earlier estimate by the CMH put the cost of mental health problems in England (rather than the UK as a whole) at £105.2 billion that year. It broke this down as £21.3 billion in health and social care costs, £30.3 billion in lost economic output, and £53.6 billion in human suffering (negative impact on quality of life). The estimate is not intended to be compared to GDP, which doesn't factor in human suffering. How many people have been depressed? An anatomy of melancholy: is depression one of the world's greatest health challenges?